My First Valentine is a Valentine's Day event. 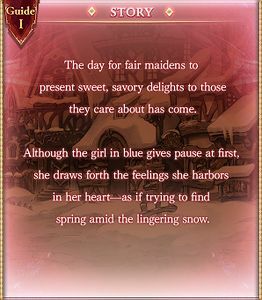 The Main Character must be Gran in order to participate in certain event quests. Complete the first two Challenge Battles to unlock the Solo Battles. Complete the Solo Battles; each awards Crystal ×50 on first-time completion. Valentine Wand is a fairly standard big, Oblivion-tagged ATK up staff of the sort early events provided. 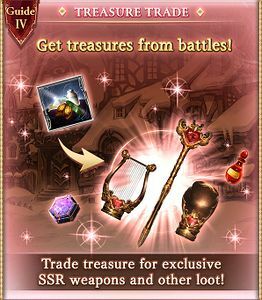 Players with an interest in starting a Dark grid should obtain one to full uncap, because the first is provided for free and the remaining three are completely trivial to farm compared to most event weapons (the entire thing can be done in a few half-potions and an hour or two). Gum Drop functions identically to a Soul Berry. Orange Juice functions identically to a Half Elixir. 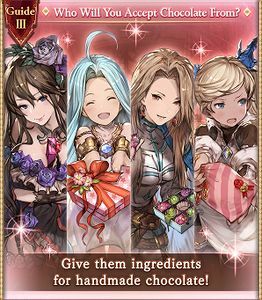 Lyria's Chocolate, Katalina's Chocolate, Io's Chocolate, and Rosetta's Chocolate each give either a character, weapon or summon 2140 EXP when used. Each character reaches maximum loyalty after ingredients are given to them six times. 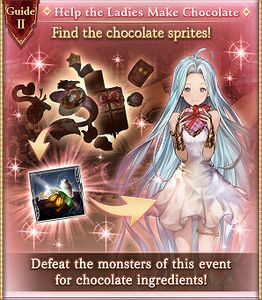 A total of 61 Chocolate Ingredients are required to maximize one character's loyalty and obtain both of their trophies. Main character needs to be set to Male for these battles and is set to be a Wind-element Fighter automatically during these. Party: Main Character and Guests Katalina, Io, and Rosetta. This quest was added at 5 p.m., Feb 14 (JST). Party: Guests Narmaya (Valentine), Medusa (Valentine), Teena (Valentine), and Lyria (Event). Completion reward: Premium Draw Ticket. Cost to Host: 20 AP Unlock: Clear Challenge Battle: "With All My Heart"
This page was last modified on 10 June 2018, at 01:53.